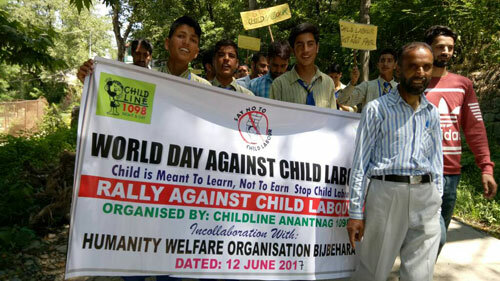 Today on 12th June 2017, On eve of World Day against child Labour, a rally was organized by Childline Anantnag at Qazigund Anantnag. 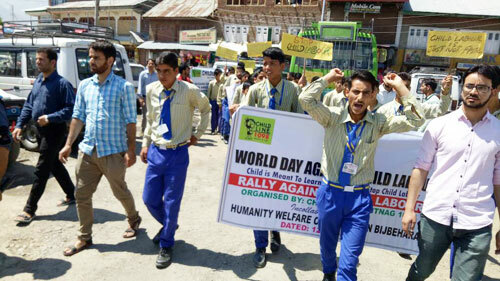 The Rally started from the premises of Boys High School under the leadership and guidance of Mr. Habibullah Wani. 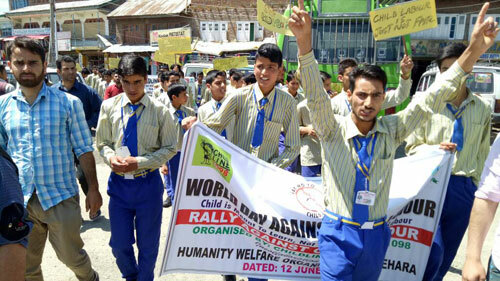 All the Staff members of Childline Anantnag & Boys High School Qazigund along-with 60 students from boys High school Qazigund participated in the rally. The theme of the rally was "Angels can't be Labourers" The rally went from all the market places of Qazigund area holding play cards banners and raising slogans against child labour tried to aware and convience the commercial sector about the menace of child labour. Rally was concluded at Government Girls Higher Secondary School Qazigund Anantnag. Dalbir Kumar Principal GGHSS Qazigund chaired the next session of programme - that was Seminar followed by quiz programme on topic: Child Labour & Child Abuse. Tabasum Rasheed of GHHS Qazigund secured 1st Position Uzma Bashir got 2ndposition while Aadil Manzoor of Boys High School Qazigund secured 3rd position. 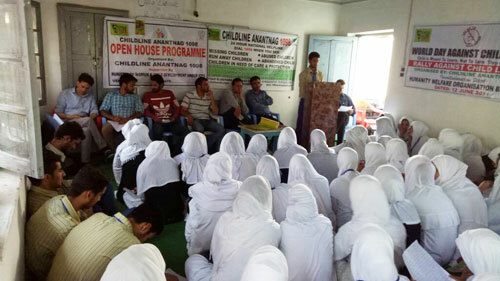 Talking on occasion Ayaash Masoodi coordinator Childline Anantnag said that Childline is 24 hours toll free landline 1098. One can dial regarding child problems. Regarding the current event he said that around national highway hundreds of child are seen working at various workshops, with passenger vehicles and shops, performing risky jobs. The children are put on risk of death for unnecessary reasons, we need to secure their rights and give them spaces in schools, playgrounds, recreational places and not in the queries and sand collecting places where they are vulnerable to diseases and sometimes become the victim of death. Childline is helping the victim children to get rehabilitated; everyone should approach on the toll free line 1098, Masoodi Added. He appealed the Society to help poor children to social fundings (Zakat) so that children are part of educational activities and not found doing manual labour. Principal Boys High School Mr Habibullah wani while thanking the organizers said that teacher fraternity should always work with honesty, dedication and sensitive approach because we are custodians of future. Children can't be ignored, once ignored means we are ignoring future. Child labour should be banned and not encouraged at all. 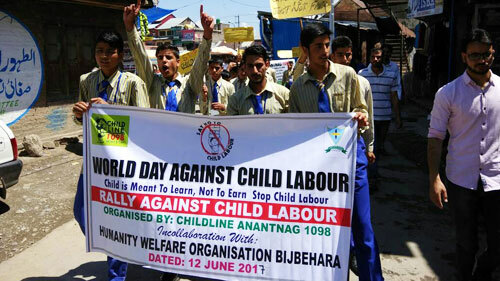 The police, administration, NGO's and Labour department should should work together to abolish child labour, Wani added. Principal Government Higher Secondary School girls Qazigund, Mr. Dalbir Kumar while talking on seminar said that every child is the asset for society. Teachers are potters to design the future of the students in schools. Thus teacher should avoid unparliamentarily languages, abused statements and bad attitude with the students that make them drop outs. Almost child labours prevailing due to povert and ignorance in society. Government should form the policy that supports poor families to earn livelihood and initiate the child education. Dalbir Kumar added. Nazarul Islam, Naseeruddin wani, Reyaz Ahmad Shah, and Mohammad Afzal Bhat childline members spoke on the occasion. 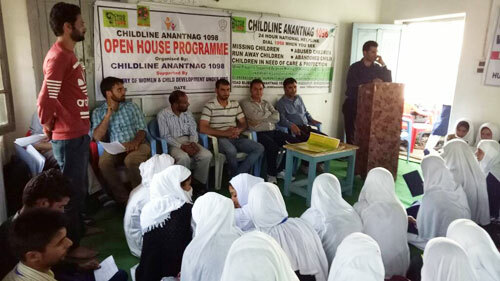 Mr Imtiaz Ahmad Kumar gave the vote of thanks and said that Childline Anantnag working under the banner of Humanity Welfare Organisation Helpline Bijbehara will organize such programmes around the district in future also. The programme was facilitated by Qazigund side team member Mohammad Afzal Bhat.